A confession: I have killed one of the least-demanding plants to grow, the air plant, Tillandsia. These tough little relatives of the pineapple take little effort, but like any indoor plant, can't survive outright neglect. And though I should have known better and given the plant a good soaking more often, it looked like it was getting along fine. Until it wasn't. It was hard to tell it was dead. A gift, the tiny Tillandsia came nestled in a painted glass globe hung from a ribbon, like a Christmas ornament. The plant arrived a steely gray color, and remained steely gray after it died. Even though I'm a gardener, I didn't know much about Tillandsia, and didn't educate myself. So the coldest month of the year, where in so many places nothing is growing, seems like the perfect time to talk about a plant that lives, not on love, but air. Actually, it doesn't, and its name is what gets people into trouble. 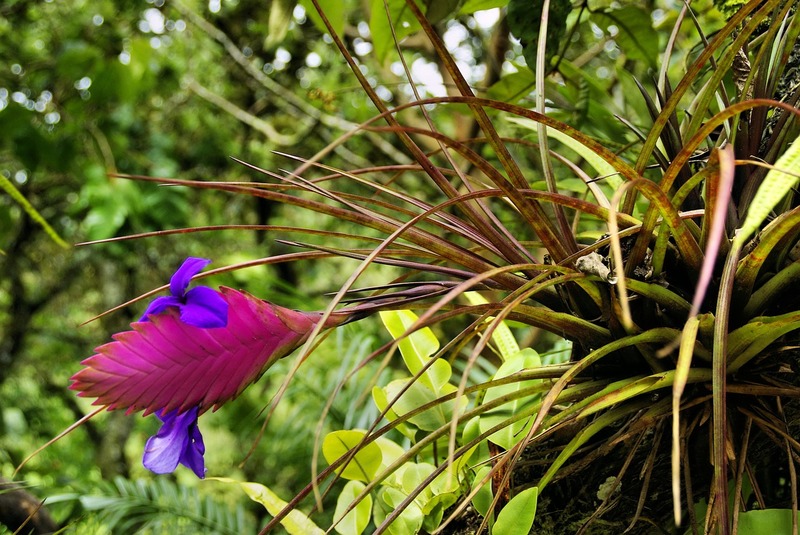 Estimates differ, but there are anywhere from 400 to 650 species of Tillandsia around the world. They are part of the Bromeliad family, and grow in parts of the southern U.S. and Mexico, and Central and South America. Some live in humid environments, some in desert conditions. Tillandsias get the name air plants because they don't grow in soil. Instead they attach themselves by their roots to crevices in trees and rocks, hang on for dear life, and absorb water and nutrients through their leaves. This makes them epiphytes – plants that don't need to grow in soil. In fact, planting one in soil is a good way to kill it. They get nourishment via their leaves, not roots. The leaves absorb rain, dust, rotting leaves and minerals that collect in the crevices of the trees or rocks they're attached to. Tillandsias are not parasitic plants; they do not steal resources from the plant they live on. Most houseplant Tillandsias are small at maturity - measured in inches - but in the wild some can get to 15 feet. Leaf colors can vary by species, but include shades of red, purple, yellow and pink in addition to the more common green, silver and icy blue. Tillandsias reproduce by growing offshoots, called pups. Many Tillandsias will bloom, but not reliably indoors, and are meant to be enjoyed for their leaves and structure rather than their flowers. Some types of Tillandsias change leaf color before they bloom. In some species that indicates the plant is monocarpic, meaning it flowers once and then dies. Offsets (pups) around the mother plant will live. Spanish moss is one of the best-known species of Tillandsia, and is not really a moss. They need bright light, especially in northern climates. Put them in the brightest place in your home. But they do not need direct sunlight. Rooms with south- or east-facing windows are best. Some direct sun is okay, but avoid a hot western exposure or hours in direct sunlight. 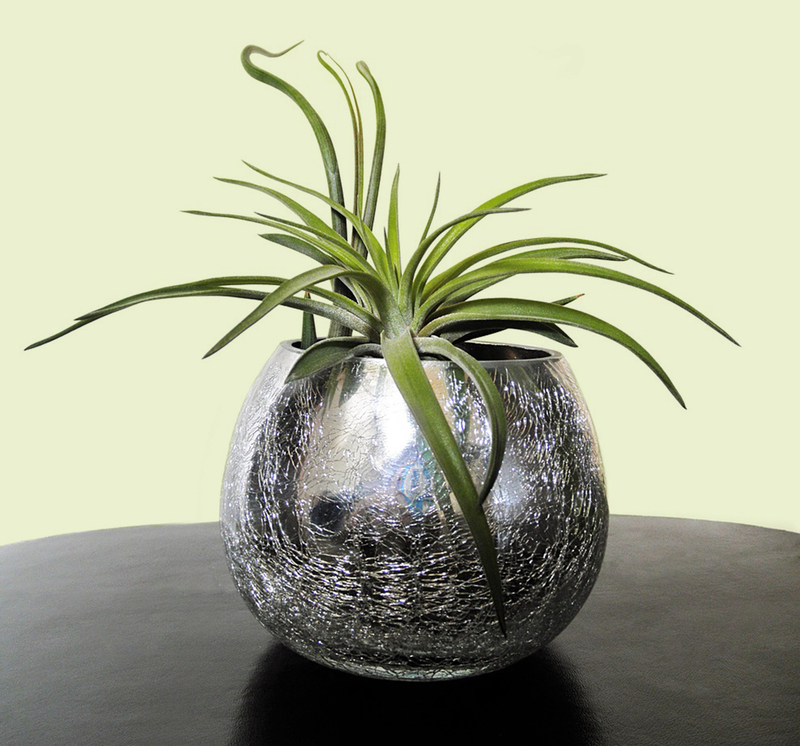 Bright bathrooms and kitchens are good places for air plants, because they are more humid than other rooms. Air plants do best in temperatures between 50 and 90° F.
Water your air plant once a week by soaking it upside down for 15 or 20 minutes. Be sure to get all the leaves wet. After its bath, shake the water out of the leaves and set to dry in an area with good air circulation. If the humidity in your house is low, misting the leaves a few days a week in addition to the soaking will keep the plant from drying out. Leaves will wrinkle or roll up when too dry. You can feed air plants with a diluted bromeliad fertilizer (17-8-22). Add the fertilizer to the soaking or misting water. Don't put sphagnum moss around an air plant. The moss holds too much moisture and can cause rot. Air plants can be grown outside. They may need to be watered more often if humidity is low. Just keep them from getting hours of hot sun. Indirect light is best. Tillandsias are often used in terrariums, though aren't a good choice for ones that are completely enclosed or those with high humidity. They are often mounted (glued or wired) to wood, stone or cork, and set on a shelf or hung on a wall. T. ionantha is commonly known as Guatemala Air Plant and is probably the most common species grown as a houseplant. The leaves often blush pink or red. 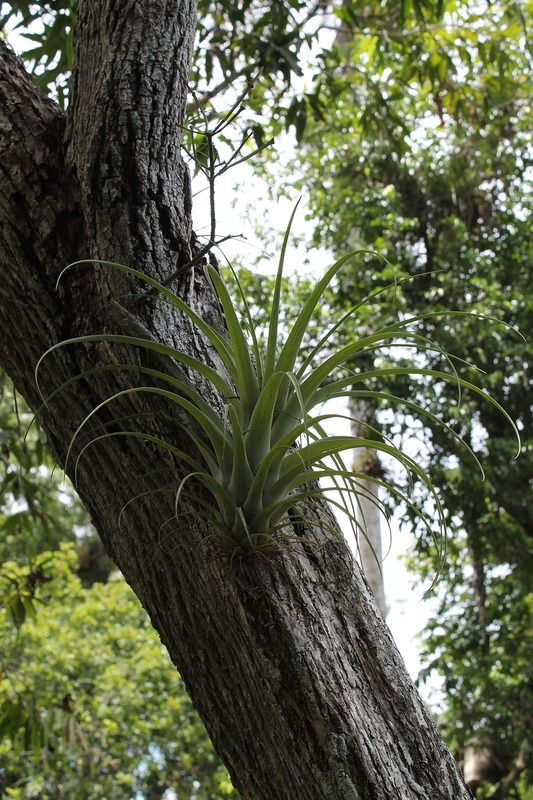 Guatemala Air Plant will rebloom two or three times a year if conditions are right. T. caput-medusae is one of the most popular air plants. The Latin name comes from Medusa, the Greek monster from mythology, because the twisting green leaves resemble Medusa's hair of live snakes. T. xerographica has been called the "king of the air plants," with long, curling leaves that look like locks of silvery-green hair. It is slow-growing, and can take more direct sun than most Tillandsias.